I've just started saving a couple of weeks ago since I have my eye on the Nokia N900? Why? Well, full flash support and a desktop-like UI seems pretty nice to have on a mobile phone. Luckily, thanks to some friends, I got to play around with the Nokia N900 and before you and I waste that much money on it, let's find out if it's worth our hard-earned bucks. 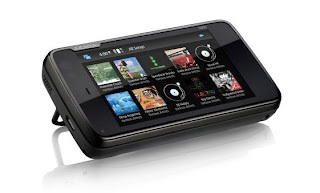 The Nokia N900 is a slider phone, or internet device if you must but it doesn't have that tilting mechanism like on the N97. Looking at pictures of the N900 on the internet, I initially thought that this mobile phone/internet tablet is going to be like a brick to carry around. It's actually shorter than my Omnia HD though thicker but only by a few centimeters. There camera on the back has a slider to protect the lens, just like the N97. 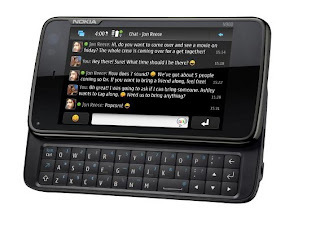 Since the N900 is has a resistive touchscreen, you might need a stylus occasionally so Nokia added a stylus which can be found on the bottom of the mobile phone. The keyboard is a bit cramped but it provides a nice tactile feedback when pressed. Overall, the design of the Nokia N900 is pretty solid and they made up for the lack of tilting screen by providing a kickstand in the back. The Maemo OS on the Nokia N900 sports three homescreens, just like Samsung's latest TouchWiz UI. And just like Samsung's TouchWiz, you can place different kind of widgets and shortcuts on your homescreen. The UI is pretty slick and a real eye candy thanks to its dedicated graphics. You can choose which wallpapers you put on each homescreen or you can choose a panorama picture so you have one long homscreen, like on the Samsung Genio. The touchscreen is pretty responsive and there's a kinetic scrolling on all lists, unlike Symbian S60. Maemo even has a task manager which let's you use multiple applications or switch between open applications which is pretty cool. Although the menu screen looks a bit like S60, again, the Nokia N900 is not a Symbian device. I guess Nokia is just trying to make it easier for those S60 users converting to the N900. The messaging application is also similar to S60, at least, when you're typing a message but your SMS/chats are shown as threaded messages. There's a separate application for email. I wasn't able to test whether the Sheet to Go or Word To Go applications is fully functional or like with other S60 devices, you have to purchase the full version but there are office applications on board. Now here's the reason why I want to buy the Nokia N900 in the first place: its browser. Nokia keeps boasting that it has full flash support. Now I REALLY want that to watch YouTube videos, visit websites loaded with flash animations, and most importantly to play Facebook games. I'm addicted to Facebook games but carrying around a netbook is still too big for me. Skyfire doesn't do it for me because flash games on Skyfire is just TOO slow. So I'm really looking forward to the Nokia N900's browser. Safari would have been the perfect mobile phone browser if only it supports flash. Anyways, Nokia delivered on its promise to have full flash support on the N900. Thankfully, flash on the N900's browser is not as slow as Skyfire. Rendering web pages is actually pretty fast though not quite as snappy as the Safari browser on the iPhone. As with Facebook games, well, Icy Tower won't load and in Farmtown, I can't move around on the farm because ther's no mouse to click and drag the screen around. I haven't tried any other flash games but so far, I'm liking the Nokia N900's browser but my friend told me that after a while there seems to be a memory leak going on and browser speeds would bog down if there's been too many applications open or if you leave the browser idle for a long time. For me that's okay. I'm a Windows Mobile user and I'm used to always closing my applications if I don't want any memory leaks. Another problem with the N900's browser is its zoom interface.Doubletapping on the screen doesn't really get you anywhere. They have that swirl to zoom feature wherein you draw circles clockwise to zoom in and counter clockwise to zoom out but that too slows down your browsing experience. The best way to zoom in on webpages on your N900 is to use the volume rocker but even that takes away the fluid user experience because reaching for the rocker is a bit awkward. It would be nice if on the next update they take a page from the Omnia's browser and put in a zoom bar on the right of the screen. The Nokia N900 has a 5 megapixel camera with dual led flash. I wasn't very excited with the sample shots I've taken. Anyways, you can judge the picture quality yourself from my Motorola Milestone and Nokia N900 comparison review. Now I understand that the Nokia N900 is first and foremost, an internet tablet so naturally, you'll have to use it in landscape mode, but since Nokia decided to put in a phone, they have to realize that smartphone users would gravitate to this device and some of us are used to using our smartphones in portrait mode. This can be pretty annoying at times and it would take a while for me to get used to that. Also, I've heard that the Nokia N900 doesn't have MMS support. Some may argue that it's already an internet device and I can always use my email but still, it's also a mobile phone and it's just surprising that Nokia decided to left this out considering that all their 3G phones support MMS. I'm actually quite happy with the Nokia N900, however, those are just my first impressions with my few hours with it and that was also how I felt with the Nokia N97, until user reviews start pouring in and they described their problems with the Nokia N97. Also, the N900 that I tested is still a pre-release version so hopefully, some kinks would be ironed out. Maybe if I could convince my friend (yes, you, Mark) to loan me the N900 for a week, I could provide a much better conclusion and decide whether I would finally splurge my hard-earned cash on the Nokia N900 or if not, I could always go for the HTC HD2 or the Samsung B7610. Actually the processor is an OMAP 3430. The N900 is a freakin awesome! I want one so bad. Check this thing out…The MaemoMobileTalk review of this is awesome too. Very good cell phone … Excellent review! AARRRGGHH!!!!! Vodafone just pushed back the release till January!! WTF? I thought this would be available this December?! Awesome phone!!! You should check out tracy and Matt's unboxing! I hope all NOkia N900s comes with that box!! I am officially ditching Nokia. After finally getting rid of my N97 on eBay, I decided to give Nokia a second chance with the N900--biggest mistake of my life. Screen is sometimes unresponsive, I get error messages using the email applications and camera. The browser is good, I'll give them that but overall, I'm disappointed yet again. I should have bought the HTC HD2 instead. Thinking of getting one from mobiles.co.uk but I've been burned by the N97 before. Any feedbacks from N900 users whether this suffers from the same problems as the N97 has? Browser is really amazing but this -phone is big. Thinking of selling it and getting the Milestone. Know where I can get any good apps for the N900? Yeeecchh. £150 for £35 a month contract for 24 months?!!!! No thanks. I'm buying the Milestone. Is the N900 for the UK getting an update too? I heard the US version is getting firmware updates already. currently browsing yoour website with my n900. Really love the browser and was able to watch the videos on your sidebar. I have to say, so far, I'm liking it. sunlight legibility is amazing on this phone. At least, compared with my Omnia. Very, very nice. 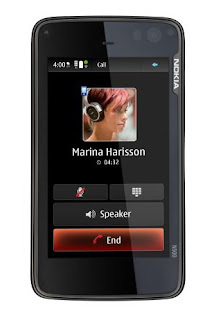 Hope Nokia develops more apps for the N900. Definitely TONS better than the N97. Should I get this or the N97? @Kenneth: Forget about the N97, it's loaded with problems. The N900 is the better choice. Thanks. BTW, how long before the GPS gets a satellite fix? Speaking of GPS. Is there any GPS apps for this other than OVI maps? @Kenneth. Gps fix is average, around 2-3 minutes. @last Anonymous. I don't know of any GPS apps that work on the N900 other than OVI maps. Such an expensive phone and I heard that Maemo is a new OS so there's not a lot of apps out there. I think I'll pass on this one and get either the milestone or the Nexus One. Love that this phone can run different OS. Some people are having problems with the microUSB connector. Anybody had the same problem? @ harry: it may sound new to our ears, however Maemo is a Linux-based OS and i supposed, you know that Linux has been operating for quite sometime already? maemo is usually used as an OS for internet tablets with of course internet/browsing capabilities at its core.